From Goodreads ~ Cora is a slave on a cotton plantation in Georgia. Life is hellish for all slaves but Cora is an outcast even among her fellow Africans, and she is coming into womanhood; even greater pain awaits. 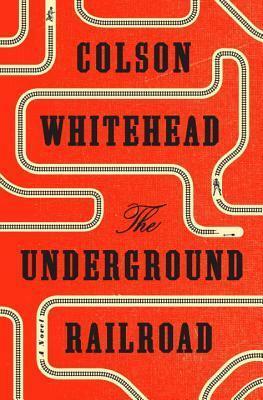 Caesar, a recent arrival from Virginia, tells her of the Underground Railroad and they plot their escape. Like Gulliver, Cora encounters different worlds on each leg of her journey. This is the story of Cora, who is a slave on a cotton plantation in Georgia in the early 1800s. Her mother abandoned her (ran away) when she was young, making her a "stray". She grew up as an odd one and never tried to fit in. Randall, the plantation owner, is mean and sadistic as is Connolly, the overseer. Slaves are abused and beaten often. When Caesar arrives on the plantation, he convinces Cora to escape with him. He has made a connection with someone who will transport them on the underground railroad to freedom. And off they go. They are being hunted by Ridgeway, a slave tracker who is still mad that he was never able to catch and bring back Cora's mother all those years ago. This book caught my attention because it's Oprah's 2016 selection for her book club. And I thought the subject matter would be interesting. But I was disappointed. I've never read a book by this author before and I found his writing awkward and hard to read ... not my style, I guess. The story jumped around between characters and periods in time. I usually don't mind this but I found it confusing in this book as the author didn't do it very well. Horrible things happen to the characters in this book but I didn't find myself drawn to them. Had Cora been more normal, maybe I would have cared more. Towards the end, I found myself skipping through the book rather than reading it. As a head's up, there are graphic descriptions of violence. Once Cora and Caesar got to the underground railway, they actually got on a train under the ground. What?! I wondered how I didn't realize the underground railroad was like a subway and marveled at the tremendous amount of work that must have been done to have all these secret tunnels under houses, barns, etc. All these years I thought it was just term and that slaves were transported secretly in wagons, etc. So, of course, I checked it out and discovered that I had been right all along and that the author had made up the subway-like train system. Why would he do that?! I thought it trivialized everything slaves had gone through. Why not stick with the truth?